Shana Kaneshiro from the UH Hilo Financial Aid Office is this year’s Best Bowl Grand Champion. Chancellor Don Straney and Marcia Heller, chancellor’s private secretary, are served culinary delights at the 3rd Annual UH Hilo-Hawai‘i Community College Best Bowl Cook-off. 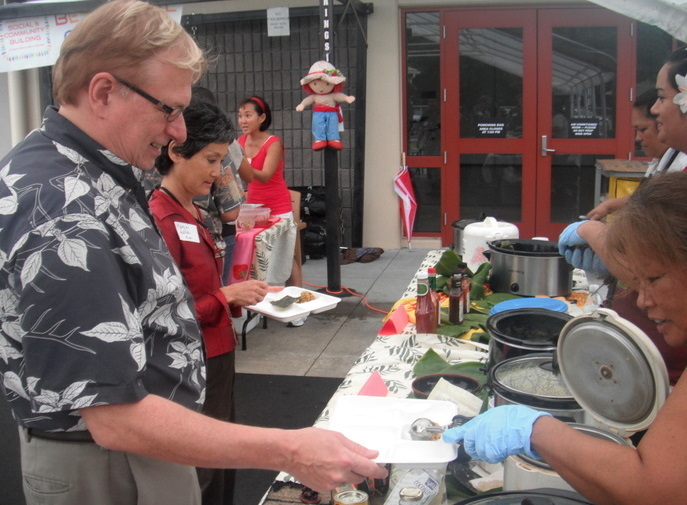 Faculty and staff of University of Hawai‘i at Hilo and Hawai‘i Community College showed off their culinary skills today at the 3rd Annual Best Bowl Cookoff held at UH Hilo’s Student Life Center. Colleagues who attended were the official “tasters” and judges who voted for their favorite dish to determine the Best Bowl on campus. 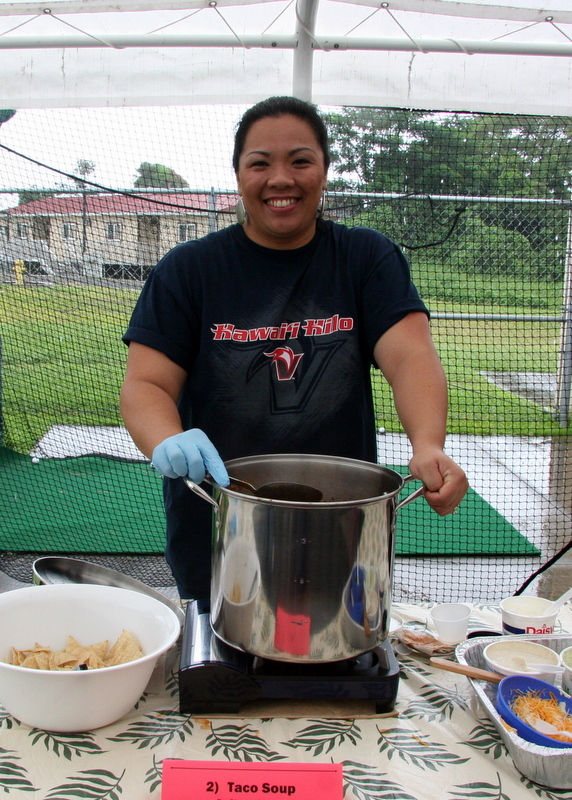 Shana Kaneshiro from the UH Hilo Financial Aid Office is this year’s Best Bowl Grand Champion. Her winning dish was a delicious Taco Soup, garnished with sour cream and cheese served with tortilla chips. She won a one-year membership to the Student Life Center. Sheila Kaupu from Auxiliary Services won Best Stew/Curry Style Bowl with her ono Kama Pulled Pork. 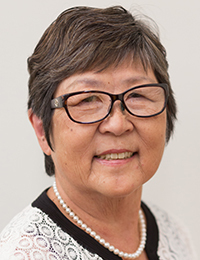 Jodi Kunimoto from the Advising Center won Best Bowl Dessert with her Red and White Delight, a medley of strawberries and cream with macadamia nut topping. All attendees (cooks and tasters) received a punch card that allows five free visits to the Student Life Center. The award for Best Bowl Grand Champion goes to Shana Kaneshiro from the Financial Aid Office. Her winning dish was Taco Soup, garnished with sour cream and cheese served with tortilla chips. 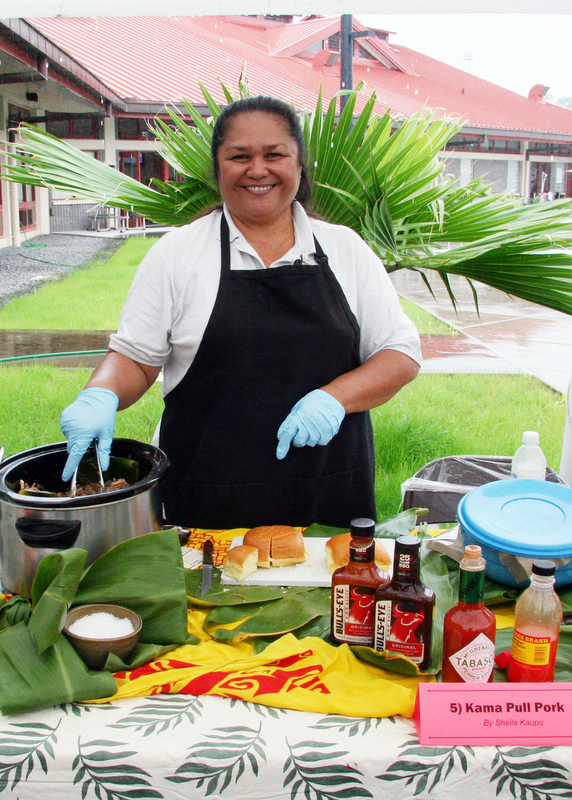 Sheila Kaupu from Auxiliary Services won Best Stew/Curry Style Bowl with her ono Kama Pull Pork. 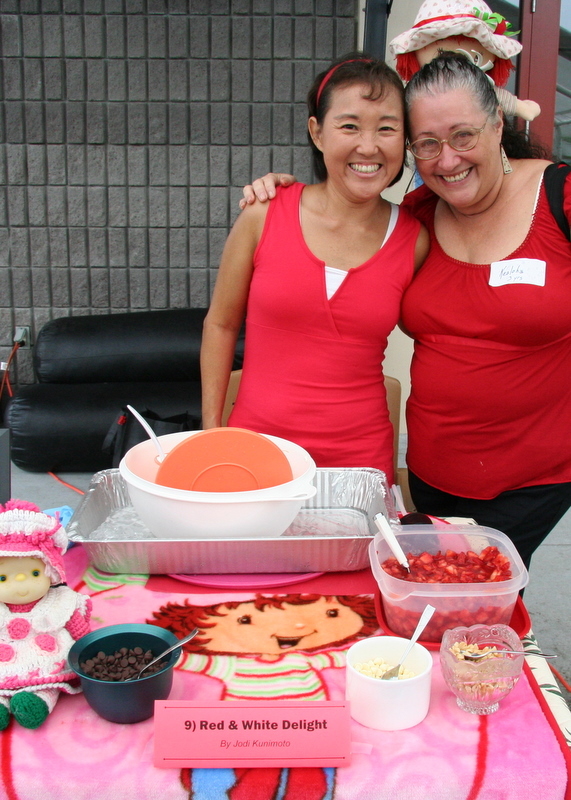 Jodi Kunimoto (at left) from the Advising Center won Best Bowl Dessert with her Red and White Delight, a medley of strawberries and cream with macadamia nut topping. Top photo of Chancellor Straney by Tim Moore. Other photos by John Oshima.